That Needs Maintenance or Repairs, We've Got You Covered! We love this business! Each and every job we do is different; each one based on the individual aspects of the project. It is our mission to design a solution to fulfill each customer's needs, keep the work within a set timeframe and tailor the scope of the project to fit the budget. We do just about anything in asphalt: paving, grading, patching, overlays and seal coating. We have done individual residential driveways as well as large industrial complexes. We are happy to provide you with a consultation and a free quote. Just give us a call and we will come out, view your project and return a written estimate. Asphalt is the pavement of choice for sustainability. It’s 100 percent reusable and recycled at a higher rate than any other material in America including soda cans and newspaper. In fact, more than 99 percent of asphalt reclaimed from old roads and parking lots goes back into new pavements. In addition, asphalt pavements are able to use waste and byproducts from other industries — reducing environmental impacts. 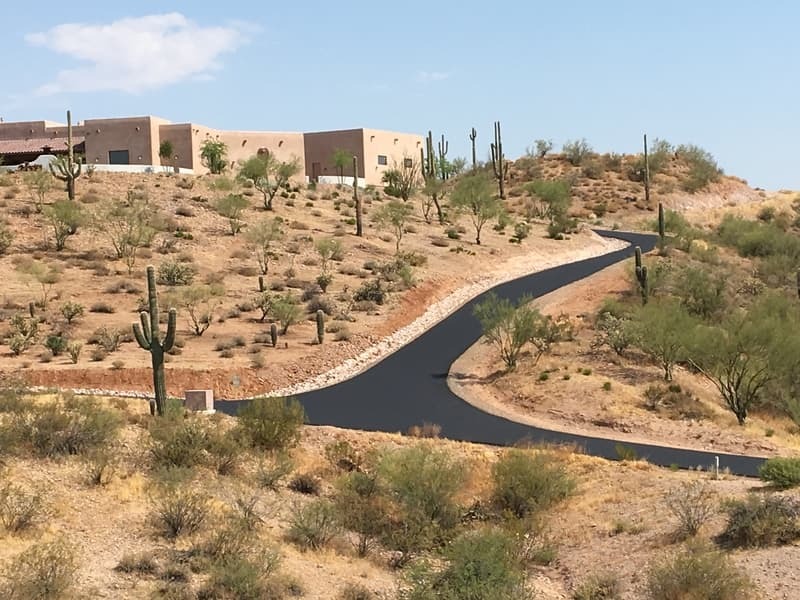 Instead of going to landfills, materials such as rubber from used tires, glass, asphalt roofing shingles and blast furnace slag can all be put to use in asphalt pavements. Over nearly 2.8 million tons of these materials were used in asphalt mixtures in 2013. Asphalt pavements require less energy to produce than other paving materials and its production emits fewer greenhouse gases than concrete pavement. In fact, the asphalt binder used to make asphalt pavements is a result of fossil fuels that were never burned and put to energy uses, such as diesel fuel or gasoline. Thus, the inherent CO2 is never released into the atmosphere. According to the U.S. Environmental Protection Agency (EPA), 99.6 percent of the carbon in asphalt binder is stored instead of contributing to greenhouse gases. Not only are asphalt pavements a very effective means of sequestering carbon, the production of liquid asphalt from the heaviest fraction of a barrel of oil is much less energy intensive than trying to convert it to a fuel for energy use. Beyond these benefits, full-depth porous asphalt pavements can be an important tool for stormwater management and have even shown to help filter water to keep pollutants out of the environment. The use of an open-graded friction course atop a dense-graded asphalt pavement has helped to filter water running off a roadway reducing water pollution. Asphalt: a mixture of dark bituminous pitch with sand or gravel, used for surfacing roads, flooring, roofing, etc. Blacktop: asphalt, or other black material used for surfacing roads. Seal coating: the application of a sealing coat to a paved surface in order to prolong its integrity. Chip sealing: the application of a bituminous binder immediately followed by the application of an aggregate. The aggregate is then rolled to embed it into the binder.